Dual display of temperature and humidity. - Select between different temperature scales (°C / °F). - Simultaneously hold both temperature and humidity readings. - Simultaneously hold both Maximum and Minimum and Average readings (MAX/MIN/AVG) with time marks. - Relative subtraction value (REL) function. - Alarm alert (SET) function. 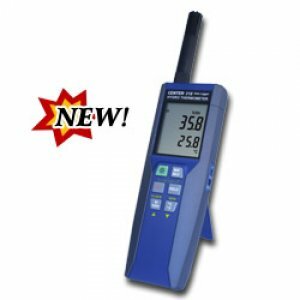 - DEW-POINT and WET-BULB temperature measurement. The Temperature /Humidity Meter has a highly accurate sensor chip to measure relative humidity and temperature. It is perfect for many industrial applications, laboratory and other types of work locations. - Display: Dual LCD display. The maximum value on the primary display is 1999. The maximum value on secondary display is 9999. - Low Battery Indicator: When the LCD displayssymbol, please replace the battery. - Sampling Rate: 1 sample per second. - Power Supply: One 9V battery, NEDA 1604, IEC 6F22 or JIS 006P. - Battery Life: 200 hours during consecutive use. - Accessories: User manual, battery, carrying case , Temperature and humidity probe(TM-183P). - Humidity Measurement Range: 1% ~ 99%RH. Temperature : ± 0.8℃, ±1.5℉.